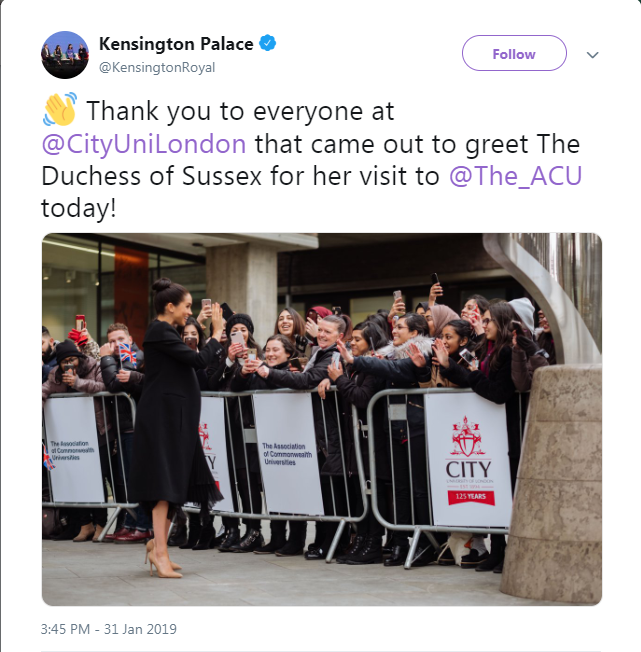 The Duchess of Sussex visits City for her first engagement as Patron of the Association of Commonwealth Universities (ACU). Almost 100 City students were in the front row to see Her Royal Highness Duchess of Sussex's first official visit to the ACU in her new role as Patron of the international organisation which is dedicated to building a better world through higher education. During the visit, The Duchess met students from the Commonwealth studying in the UK, for whom access to university has transformed their lives. City students, staff and local residents were invited to be part of the crowd which gave Her Royal Highness a special welcome. Azaan Asghar, (BSc Economics), said: “I was so excited for the visit as not only is she an actress in a huge industry she is also royalty as the Duchess of Sussex. “It is amazing that she is here as there are so many universities in London but City is prestigious and I feel proud that she and the ACU are here at our university. I was looking for a flag to wave but there were too many fans! I felt so excited to see her here at our university! I have always wanted to be a part of this kind of experience as I am an international student and they do not do this kind of thing back home! This was a great opportunity to see someone so strongly in the public eye on our doorstep. I was just in class earlier and I couldn’t really be any closer now. Today is news day on our course, which is where we have to cover news as it is happening. For this we have two students in the press pen and I am here seeing it in action, so visits like this will give me some great experience in my career as a broadcast journalist. Following the visit @KensingtoRoyal posted a tweet thanking students for such a warm reception. See City’s IGTV for full student interviews and reactions.